Two types of thermometers that are good to have when owning chickens are the long-stemmed compost thermometer and a regular outdoor thermometer for measuring the internal coop temperature. You can find compost thermometers for sale on the Internet. They have a temperature dial on top of a long heat-sensitive stem that’s usually 19 inches in length. 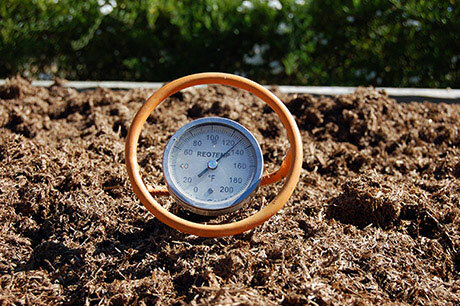 Compost thermometers typically cost between $25 and $35. Gardener’s Supply carries compost thermometers. Place a small thermometer inside your chicken coop as another beneficial tool to help you manage your chickens. A thermometer comes in handy to keep you abreast of the temperatures your chickens are experiencing. The more comfortable you can keep your chickens, the healthier and happier they will be. Blend compost with a pitchfork and put a small rake to use. Having small tools on hand to help blend compost and rake up debris is a good idea. A pitchfork is a great tool for blending and turning over your compost pile. A pitchfork is similar to a garden shovel, except that it has a base of five separated sharp prongs that can dig in and grab dense material. Your pitchfork is key to aerating a compost pile. Keep it handy near your composting area, because the more you use it, the faster your compost pile will break down. Store it in a nearby shed, and keep it out of the weather. 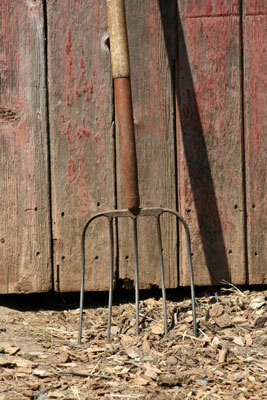 A small rake with a head size base of nine inches is handy for cleaning around the chicken coop and outside pen. It functions like a normal sized rake, but can get into small spaces and tight corners. These rakes are small, but if you find the rake handle is too tall and cumbersome, cut the handle down to your desired height, and sand down the cut edge. Store feed in a clean metal garbage can. One of the easiest and most economical methods of storing your chicken feed is in a clean metal garbage can within a storage area. Unfortunately, plastic and wood materials aren’t infallible against wildlife freeloaders. A clean metal garbage can easily hold two 50-pound bags of chicken feed. Wildlife can’t easily gnaw or access feed stored in metal containers. 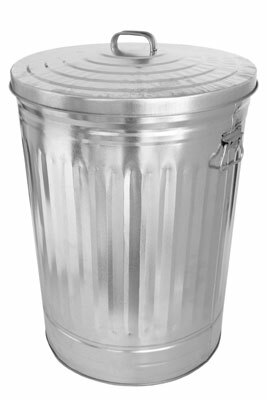 Store this metal garbage container in a clean, dry storage area, ideally near your chicken coop. Employ a sturdy scoop for the feed bucket. Raising chickens means you’re going to be filling a lot of feed buckets over time, so make your scooping easier by finding a nice, sturdy, and generous metal scoop. 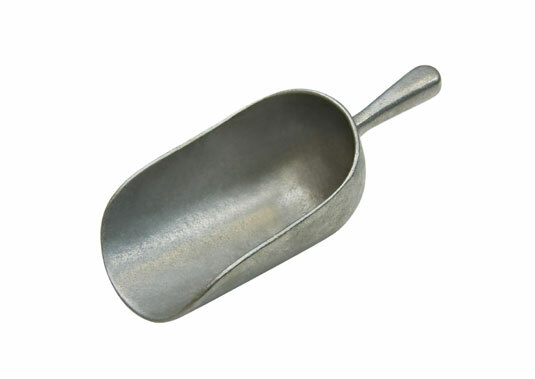 You can find scoops at agricultural supply businesses, feed stores, and even at flea markets. Using empty plastic food containers, such as yogurt or cottage cheese tubs, isn’t ideal. Feed is heavy, and you want to make the chore of feeding your chickens easy. A sturdy scoop has a nice supporting handle with a gently curving end to direct feed into your bucket. You don’t want to spill feed, which is wasteful and can attract rats and mice. Make sure your chickens are secure with locks. Make sure that every door and window can be secured, when needed, with hook-and-eye clips with a spring-loaded latching mechanism or some other type of secure locking mechanism. Install steel poles and quarter-inch hardware cloth across windows for strength and security. Raccoons are notorious for their dexterous paws that are skilled in opening chicken coops, and their ability of catching part of a chicken through a surprisingly small half-inch gap. 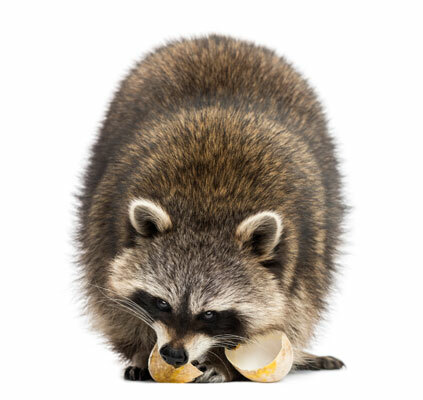 Raccoons have the same dexterity and ability to figure out a lock as a two-year-old. If a two-year-old can figure out a lock so can a cunning predator. Clean tight areas with a hand brush and dustpan. 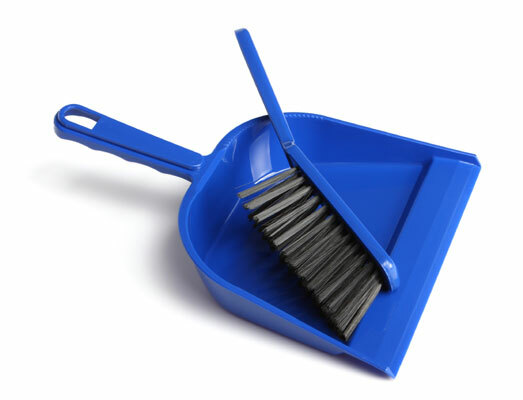 A small hand brush and dustpan is another great tool for cleaning around your chicken coop. Think of it as your duster. This hand brush is also a perfect size to get into tight areas and corners of your coop. It sweeps away cobwebs and dust. If you have quarter-inch or half-inch wire hardware cloth over your chicken coop windows, a hand brush is a great way to dust off the wire mesh. Protect yourself with dust masks. Always wear a dust mask when cleaning your chicken coop. Use the best possible mask you can purchase. Cleaning a chicken coop and outside pen stirs up incredible dust, dirt, and debris. 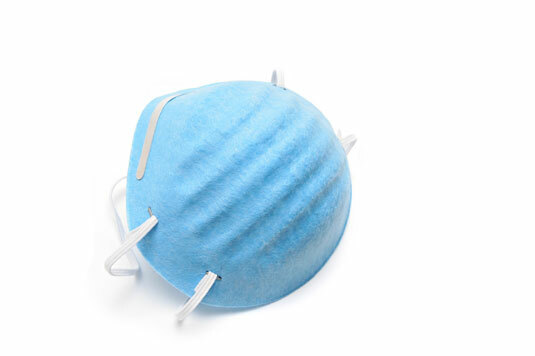 A good mask keeps all the stirred-up debris in the air and out of your lungs. Make sure the mask fits securely over your face. It doesn’t hurt to wear a baseball cap, protection glasses, and gloves as well. The cleaner you keep your coop on a daily basis, the easier it is to thoroughly deep clean your coop at least twice a year, if not on a quarterly basis. Use a brooder clamp heater. 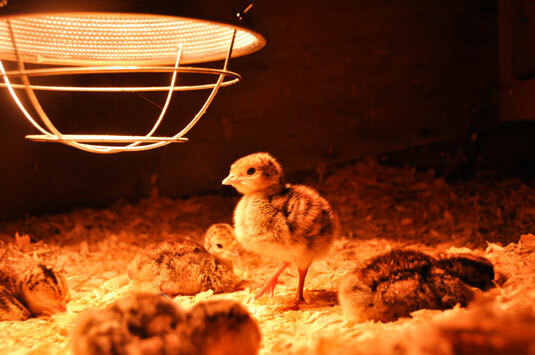 Chicks need supplemental heat in the form of a brooder heater which maintains a temperature of 95 degrees Fahrenheit. Some brooders come with a clamp for attachment. It is wise to use a clamp, and a secondary measure such as a bungee cord or rope to keep the brooder heater securely in place. Chicks need supplemental heat for at least the first four to six weeks of their lives, and maybe longer depending on the season and temperatures. Young chicks need a cozy, dry, quiet, and protective environment to thrive and grow. Re-purpose a soft baby play tent. When chicks are six weeks old and have their feathers, you can take them off their brooder heat. Chicks are curious and adventuresome. Put them in a soft baby play tent, and they’ll be safe and happy. Make sure you put this baby play tent in a safe room, such as your garage, away from the family dog or curious cats. Remember, chicks at this age aren’t ready for a yard or chicken coop with breezes, sun, and weather elements. This play tent is one of the best-kept secret tools for raising chicks. You can place a soft baby play tent on a floor. It’s totally enclosed with bottom, sides, and top. It has netting-like sides for air circulation. Chicks can see out, and you can see in to observe them. It’s a nice size for a baker’s dozen, which is 13 chicks. Remember chicks grow very fast, and will soon outgrow this soft baby play tent, the more chicks you have in it. This playpen is mobile and safe. Before placing your soft baby playpen in a designated spot, you may want to put layers of newspaper down to cover the floor area, because sometimes bedding flies out onto the floor. Place a nice layer of bedding for your chicks in the bottom of the soft baby playpen. Add your chick starter food and water, and lastly your chicks. Train chickens with a pet clicker. You can better manage your chickens through training and positive conditioning. The earlier you can start training your chickens the better. 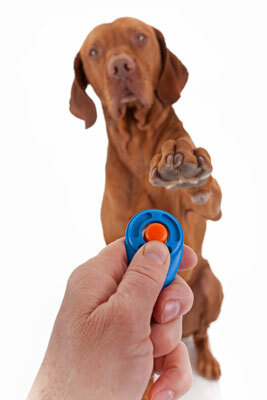 A simple, inexpensive, plastic pet clicker with a metal tab is available at pet stores like Petco, PetSmart, and PetSense. These simple finger clickers make a distinctive noise and are an essential element for training your chickens. They can usually be heard from all over the garden. String yours on a piece of leather or ribbon, and put it around your neck for convenience.